In January 2014, Microsoft announced that their investment in Microsoft InfoPath had come to an end. 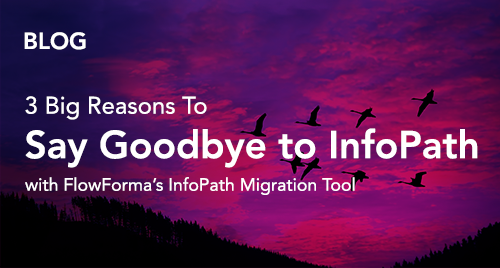 With no recommended migration path in the SharePoint ecosystem, FlowForma® has created its very own InfoPath replacement. Organizations who currently use InfoPath® as an eForms solution, are facing the challenge of finding an alternative to their depreciated and no longer supported InfoPath. With many businesses using InfoPath since its inception in 1999, the thought of migrating can be daunting. Dedicated to making the complex simple, FlowForma has simplified the InfoPath forms migration challenge for clients, by developing a unique InfoPath replacement solution. This tool enables FlowForma to accelerate the migration of business process steps and fields to the FlowForma Process Automation environment. Read our blog 3 Big Reasons to Say Goodbye to InfoPath.